Journey is an American rock band that formed in San Francisco in 1973, composed of former members of Santana and Frumious Bandersnatch. The band has gone through several phases; its strongest commercial success occurred between 1978 and 1987 when Steve Perry was lead vocalist. During that period, the band released a series of hit songs, including "Don't Stop Believin'" (1981), which in 2009 became the top-selling track in iTunes history among songs not released in the 21st century. Its parent studio album, Escape, the band's seventh and most successful, reached No. 1 on the Billboard 200 and yielded another of their most popular singles, "Open Arms". Its 1983 follow-up album, Frontiers, was almost as successful in the United States, reaching No. 2 and spawning several successful singles; it broadened the band's appeal in the United Kingdom, where it reached No. 6 on the UK Albums Chart. Journey enjoyed a successful reunion in the mid-1990s and later regrouped with a series of lead singers. Sales have resulted in two gold albums, eight multi-platinum albums, and two diamond albums (including seven consecutive multi-platinum albums between 1978 and 1987). They have had eighteen Top 40 singles in the U.S. (the second most without a Billboard Hot 100 number one single behind Electric Light Orchestra with 20), six of which reached the Top 10 of the US chart and two of which reached No. 1 on other Billboard charts, and a No. 6 hit on the UK Singles Chart in "Don't Stop Believin'". In 2005, "Don't Stop Believin'" reached No. 3 on iTunes downloads. Originally a progressive rock band, Journey was described by AllMusic as having cemented a reputation as "one of America's most beloved (and sometimes hated) commercial rock/pop bands" by 1978, when they redefined their sound by embracing pop arrangements on their fourth album, Infinity. According to the Recording Industry Association of America, Journey has sold 48 million albums in the U.S., making them the 25th best-selling band. Their worldwide sales have reached over 75 million records, making them one of the world's best-selling bands of all time. A 2005 USA Today opinion poll named Journey the fifth-best U.S. rock band in history. Their songs have become arena rock staples and are still played on rock radio stations across the world. Journey ranks No. 96 on VH1's 100 Greatest Artists of All Time. The original members of Journey came together in San Francisco in 1973 under the auspices of former Santana manager Herbie Herbert. Originally called the Golden Gate Rhythm Section and intended to serve as a backup group for established Bay Area artists, the band included Santana alumni Neal Schon on lead guitar and Gregg Rolie on keyboards and lead vocals. Bassist Ross Valory and rhythm guitarist George Tickner, both of Frumious Bandersnatch, rounded out the group. Prairie Prince of The Tubes served as drummer. The band quickly abandoned the "backup group" concept and developed a distinctive jazz fusion style. After an unsuccessful radio contest to name the group, roadie John Villanueva suggested the name "Journey". The band's first public appearance came at the Winterland Ballroom on New Year’s Eve, 1973. Prairie Prince rejoined The Tubes shortly thereafter, and the band hired British drummer Aynsley Dunbar, who had recently worked with Frank Zappa. On February 5, 1974, the new line-up made their debut at the Great American Music Hall and secured a recording contract with Columbia Records. Journey released their eponymous debut album in 1975, and rhythm guitarist Tickner left the band before they cut their second album, Look into the Future (1976). Neither album achieved significant sales, so Schon, Valory, and Dunbar took singing lessons in an attempt to add vocal harmonies to Rolie's lead. The following year's Next contained shorter tracks with more vocals, and featured Neal Schon as lead singer on two of the songs. Journey's album sales did not improve and Columbia Records requested that they change their musical style and add a frontman, with whom keyboardist Gregg Rolie could share lead vocal duties. The band hired Robert Fleischman and transitioned to a more popular style, akin to that of Foreigner and Boston. Journey went on tour with Fleischman in 1977 and together the new incarnation of the band wrote the hit "Wheel in the Sky"; however, management differences resulted in Fleischman leaving within the year. In late 1977, Journey hired Steve Perry as their new lead singer. Herbie Herbert, the band's manager, also hired Roy Thomas Baker as a producer to add a layered sound approach as Baker had done with his previous band, Queen. With their new lead singer and new producer, Journey released their fourth album, Infinity (1978). 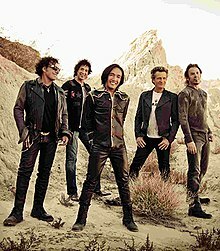 This album was their first RIAA-certified platinum album, and with their hit song "Wheel in the Sky" (#57 U.S.), Journey set on a new path with a more mainstream sound to make their highest chart success to date. In late 1978, manager Herbie Herbert fired drummer Aynsley Dunbar, who joined Bay Area rivals Jefferson Starship shortly thereafter. He was replaced by Berklee-trained jazz drummer Steve Smith. Perry, Schon, Rolie, Smith and Valory recorded Evolution (1979), which gave the band their first Billboard Hot 100 Top 20 single, "Lovin', Touchin', Squeezin'" (#16); and Departure (1980), which reached No. 8 on the album charts. Journey's newfound success brought the band an almost entirely new fan base. During the 1980 Departure world tour, the band recorded a live album, Captured. Keyboardist Gregg Rolie then left the band, the second time in his career he left a successful act. Keyboardist Stevie "Keys" Roseman was brought in to record the lone studio track for Captured, "The Party's Over (Hopelessly in Love)," but Rolie recommended pianist Jonathan Cain of The Babys as the permanent replacement. With Cain's replacement of Rolie's Hammond B-3 organ with his own synthesizers, the band was poised for a new decade in which they would achieve their greatest musical success. With Cain on board, the band began writing material that would eventually lead up to Journey's biggest studio album, Escape. Recording sessions began in April 1981, and lasted until the middle of June. Escape was released on July 31, 1981, and immediately the album became a mainstream success. The album, which has thus far sold nine times platinum, went to number one on the album charts later that year, and included three top-ten hits: "Who's Cryin' Now", "Don't Stop Believin'" and "Open Arms". The last is Journey's highest-charting single to date, staying at No. 2 for six consecutive weeks and ranking at No.34 on Billboard's 1982 year-end Hot 100. MTV videotaped one of their two sold-out shows in Houston on November 6, 1981, in front of over 20,000 fans. This success was met with criticism. The 1983 Rolling Stone Record Guide gave each of the band's albums only one star, with Dave Marsh writing that "Journey was a dead end for San Francisco area rock." Marsh later would anoint Escape as one of the worst number-one albums of all time. Journey's next album, Frontiers (1983), continued their commercial success, reaching No. 2 on the album charts, selling nearly six million copies. The album generated four Top 40 hits, "Separate Ways (Worlds Apart)", which reached No. 8, "Faithfully", which reached No. 12, "Send Her My Love" and "After the Fall", both of which reached No. 23. By this time, Journey had become one of the top touring and recording bands in the world. During the subsequent stadium tour, the band contracted with NFL Films to record a video documentary of their life on the road, Frontiers and Beyond. Scenes from the documentary were shot at JFK Stadium in Philadelphia, Pennsylvania with more than 80,000 fans in attendance. After the Frontiers stadium tour, Journey decided to take some time off. Lead singer Steve Perry and guitarist Neal Schon both pursued solo projects between 1982 and 1985. The band released two songs previously intended for Frontiers: "Ask the Lonely", on the soundtrack to the movie Two of a Kind (1983); and "Only the Young", on the soundtrack to the movie Vision Quest (1985). "Only the Young" reached No. 9 on the Billboard Hot 100 chart. When Journey finally returned to record their album Raised on Radio (1986), bass player Ross Valory and drummer Steve Smith were fired from the band for musical and professional differences. Bassist and future American Idol judge Randy Jackson, bassist Bob Glaub, and established drummer Larrie Londin handled the two vacant slots. The album went multiplatinum, selling over two million copies. It also produced four top 20 singles, "Be Good to Yourself" (#9), "I'll Be Alright Without You" (#14), "Girl Can't Help It" and "Suzanne", both of which reached No. 17. The tour featured Jackson on bass and Mike Baird on drums, and was videotaped by MTV and made into a documentary, which included interviews with the band members. But with Perry unable or unwilling to remain actively involved, the band cancelled the rest of the tour and went on an extended, indefinite hiatus. Schon and Cain spent the rest of 1987 collaborating with artists such as Jimmy Barnes and Michael Bolton before teaming up with Cain's ex-Babys bandmates John Waite and Ricky Phillips to form the supergroup Bad English with drummer Deen Castronovo in 1988. Steve Smith devoted his time to his jazz bands, Vital Information and Steps Ahead, and teamed up with Ross Valory and original Journey keyboardist Gregg Rolie to create The Storm with singer Kevin Chalfant and guitarist Josh Ramos. On November 3, 1991, Schon, Cain, and Perry reunited to play several songs at the Bill Graham tribute concert. To date this is the last time Perry would sing in concert with former Journey bandmates. After the breakup of Bad English in 1991, Schon and Castronovo formed the glam metal band Hardline with brothers Johnny and Joey Gioeli, before joining Paul Rodgers' backing band in 1994. Cain spent the next few years focusing on his solo career. Between 1987 and 1995, Columbia Records released three Journey compilations, including the 1988 greatest hits album, which remains the band's best-selling record. It continues to sell 500,000 to 1,000,000 copies per year. By December 2008, it was the sixth best-selling greatest hits package in the United States, and by 2014 had spent 300 weeks on the Billboard 200 (one of only five albums to do so). In 1995, the Escape and Frontiers lineup (Perry, Schon, Cain, Valory and Smith) reunited under new management, signing with Irving Azoff, longtime Eagles manager. Trial by Fire, released in 1996, included the hit single "When You Love a Woman", which reached No. 12 on the Billboard charts, ranked at No. 36 on the 1996 year-end Hot 100, and was nominated in 1997 for a Grammy Award for Best Pop Performance by a Duo or Group with Vocal. The album also produced three top 40 mainstream rock tracks, "Message of Love" reaching No. 18, "Can't Tame the Lion" reaching No. 33, and "If He Should Break Your Heart" reaching No. 38. Plans for a subsequent tour ended when Perry injured his hip while hiking in Hawaii in the summer of 1997, and could not perform without hip replacement surgery – which for some time he refused to undergo. He later announced that he was permanently leaving the band. In 1998, Schon and Cain decided to seek a new lead singer, at which point drummer Steve Smith left the band as well. In 1998, after auditioning several high-profile candidates, including Geoff Tate and John West, Journey replaced Perry with Steve Augeri, formerly of Tyketto and Tall Stories. The band hired drummer Deen Castronovo, Schon's and Cain's Bad English bandmate and drummer for Hardline, to replace Steve Smith. In 2000, the band released their next studio album, Arrival in Japan. A US release followed in 2001. "All the Way" became a minor adult contemporary hit from the album. In 2002, the band released a four-track CD titled Red 13, with an album cover design chosen through a fan contest. In 2005, the band was inducted into the Hollywood Walk of Fame, embarked on their 30th anniversary tour, and released their twelfth full-length studio album, Generations, in which each band member performed lead vocals on at least one song. In July 2006, Steve Augeri was dropped from the band while they toured with Def Leppard, the official site referring to a "chronic throat infection." Augeri had been suffering from vocal attrition problems since 2003 and Journey had been accused of using pre-recorded lead vocals. For nearly a year, Jeff Scott Soto from Talisman filled in with the band for several months referring to him as their official lead singer. However, in June 2007, the band announced that Soto was no longer with them. That spring, HBO aired the finale of the series The Sopranos, concluding with Journey's "Don't Stop Believin'" emanating from a diner jukebox. Without a lead singer, the band found itself unable to tour to capitalize on the heightened nostalgia for 1980s music demonstrated by the series. In the summer of 2007, Jonathan Cain and Neal Schon began searching YouTube for a new lead singer. They auditioned Jeremey Hunsicker of the Journey tribute band Frontiers, with whom they co-wrote "Never Walk Away", for their next album. [unreliable source?] Ultimately the band hired another YouTube find, Filipino singer Arnel Pineda of the cover band The Zoo. Although Pineda was not the first foreign national to become a member of Journey (former drummer Aynsley Dunbar is British), nor even the first non-Caucasian (former bass player Randy Jackson is African-American), the transition resulted in what Marin Independent Journal writer Paul Liberatore called "an undercurrent of racism among some Journey fans". Keyboardist Jonathan Cain responded to such sentiments: "We've become a world band. We're international now. We're not about one color." Journey's first album with Pineda, Revelation, debuted at No. 5 on the Billboard charts, selling more than 196,000 units in its first two weeks and staying in the top 20 for six weeks. As a multi-disc set (2-CD) each unit within that set counts as one sale. Journey also found success on Billboard's Adult Contemporary chart where the single "After All These Years" spent over 23 weeks, peaking at No. 9. Receipts from the 2008 tour made Journey one of the top-grossing concert tours of the year, bringing in over $35,000,000. On December 18, 2008, Revelation was certified platinum by RIAA. The band's second album with Pineda, Eclipse, was released on May 24, 2011, and debuted at No. 13 on the Billboard 200 chart. In 2011, the band also released Greatest Hits 2. In 2015, Deen Castronovo was arrested and charged with fourth-degree assault and menacing after police say he physically injured a woman. As a result, he was fired by Journey from upcoming performances and was ultimately replaced by Omar Hakim on the band's 2015 tour. In 2016, Steve Smith again returned as Journey's drummer, reuniting all of the members of the Escape-Frontiers-Trial by Fire lineup except lead singer Steve Perry. After featuring the members of the band in various poses for the first three studio albums, in 1980 Journey adopted the logo of the scarab beetle, a symbol borrowed from Egyptian hieroglyphs. Over the years, Journey songs have been heard or referred to in numerous films, television series, video games, and even on Broadway. The band's songs have been covered by multiple artists and adopted by sports teams. In particular, "Don't Stop Believin'" was heard in the final episode of The Sopranos, adapted by the television series Glee, sung by the Family Guy cast, adopted as the unofficial anthem of the 2005 and 2010 World Series champion baseball teams, performed by The Chipmunks in their album Undeniable (2008), and sung by the cast of the Broadway musical Rock of Ages. On March 8, 2013, a documentary, Don’t Stop Believin’: Everyman’s Journey, was released. The movie, directed by Ramona S. Diaz, chronicles the discovery of Arnel Pineda and his first year with Journey. ^ Bashe, Philip (1985). Heavy Metal Thunder: The Music, Its History, Its Heroes. Doubleday. p. 33. ISBN 978-0-3851-9797-7. ^ Ruhlmann, William. "Journey - Music biography". AllMusic. Retrieved October 3, 2012. ^ Buckley, Peter (2003). The Rough Guide to Rock (3rd ed.). Rough Guides. p. 550. ISBN 1-84353-105-4. ^ McCormick, Neil (January 9, 2014). "The greatest American rock band of all time? Surely not Guns N' Roses". The Daily Telegraph. Retrieved September 16, 2017. ^ George-Warren, Holly; Romanowski, Patricia, eds. (2001). The Rolling Stone Encyclopedia of Rock & Roll (3rd ed.). Fireside. p. 511. ISBN 0-7432-9201-4. ^ Lynskey, Dorian (December 16, 2010). "Don't Stop Believin': the power ballad that refused to die". The Guardian. Retrieved September 17, 2017. ^ "Gold & Platinum Searchable Database". Recording Industry Association of America. Archived from the original on September 24, 2015. Retrieved April 18, 2014. ^ "The Sony Music Journey Home | The Sony Music Journey Site". Journeyband.com. Archived from the original on July 25, 2009. Retrieved August 3, 2009. ^ Journey: Infinity. AllMusic. Retrieved September 2, 2010. ^ "Watch again- Friday's programme". BBC News. June 3, 2011. Retrieved May 8, 2017. ^ "RIAA Gold and Platinum Data". Recording Industry Association of America. Archived from the original on July 1, 2007. Retrieved September 10, 2010. ^ "And the greatest American rock band ever is". USA Today. July 5, 2005. Retrieved August 3, 2009. ^ "Journey". Rock and Roll Hall of Fame. Retrieved April 17, 2017. ^ a b Journey: Frontiers and Beyond video, NFL Films, 1983. ^ "Journey FAQ at Steve Lake's Journey Tribute Page". Journey-tribute.com. Retrieved September 10, 2010. ^ "Interviews:". Melodicrock.com. Retrieved March 1, 2011. ^ "Robert Fleischman interview at The Journey Zone". Journey-zone.com. August 14, 2009. Retrieved September 10, 2010. ^ a b "Steve Smith interview at The Journey Zone". Journey-zone.com. Retrieved September 10, 2010. ^ Captured re-issue (2006) liner notes, p. 15, lines 8–9; Time (Cubed) liner notes pp. 11–14. ^ Journey: Live in Houston DVD, 1981. ^ "Discography". Journeymusic.com. Archived from the original on February 3, 2008. ^ "2001 Herbie Herbert Interview with Matt Carty, pp. 13–14". Members.cox.net. Archived from the original on October 23, 2011. Retrieved September 10, 2010. ^ "The Q: GQ". Men.style.com. Archived from the original on February 1, 2009. Retrieved March 1, 2011. ^ "Gold & Platinum – August 3, 2009". RIAA. Archived from the original on January 17, 2010. Retrieved August 3, 2009. ^ "39th Annual Grammy Award Winners and Nominees for 1997". Rock on the Net. February 26, 1997. Retrieved September 10, 2010. ^ "Behind the Music: Journey". Vh1. Retrieved September 10, 2010. ^ a b Pappademas, Alex (May 29, 2008). "Foolish, Foolish Throat: A Q&A with Steve Perry". Men.style.com. Archived from the original on February 1, 2009. Retrieved March 1, 2011. ^ "Melodicrock Interviews: Neal Schon". melodicrock.com. Retrieved September 10, 2018. ^ "A Personal Journey Chapters Six, Seven, and Eight". Journey-zone.com. Retrieved September 10, 2010. ^ "'Journey names Jeff Scott Soto official new lead singer' at". Punktv.ca. Retrieved September 10, 2010. ^ "'Journey announces departure of Jeff Scott Soto' reprinted from journeymusic.com at The Journey Zone". Journey-zone.com. Retrieved September 10, 2010. ^ Dickens, Tad (January 9, 2008). "His new Journey leads to old Frontiers". Roanoke Times. Archived from the original on February 1, 2013. ^ "Jeremey Hunsicker - Different Guy, Same Ol' Sound." Yahoo Voices. April 7, 2008. Archived from the original on July 28, 2014. Retrieved April 18, 2014. ^ Liberatore, Paul (December 27, 2007). "An incredible journey for band's new frontman". Marinij.com. Retrieved September 10, 2010. ^ "Three Lions (Frontiers, 2014)". Melodicrock.com. Retrieved April 18, 2014. ^ "Certification Criteria". Recording Industry Association of America. Retrieved April 18, 2014. ^ "Journey - Chart history". Billboard. Retrieved September 10, 2010. ^ "Top 25 Tours - Billboard Year In Music 2008". Billboard. November 11, 2008. Archived from the original on May 20, 2009. ^ "Gold & Platinum Searchable Database". Recording Industry Association of America. Archived from the original on September 24, 2015. Retrieved September 10, 2010. ^ "Madonna still tops the list of the top-grossing concert tours". Jam!. December 3, 2008. Archived from the original on December 5, 2008. ^ "The Billboard 200 for the 6/11/2011 issue". Reuters. June 3, 2011. Retrieved April 18, 2014. ^ "Journey Welcome Back Drummer Steve Smith, Announce 2016 Tour With Doobie Brothers". Ultimate Classic Rock. November 24, 2015. ^ "Journey Members Reflect on Importance of 'Sopranos' and 'Glee,' Talk PBS Doc". hollywoodreporter.com. August 6, 2013. Retrieved August 6, 2016. ^ "8 great pop-culture spins on Journey's Don't Stop Believin'". Alabama Media Group. June 2, 2016. Retrieved August 6, 2016. ^ www.nadesignlab.com, Andy Owens,. "Don't Stop Believin' : Everyman's Journey". www.everymansjourney.com. Retrieved July 17, 2017. Wikimedia Commons has media related to Journey (musical group).